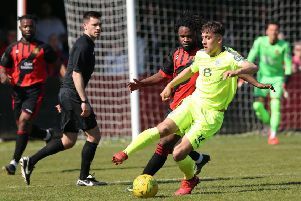 Little Common Football Club player-manager Russell Eldridge stressed the importance of results over performances after Easter Monday’s win over Bexhill United. Eldridge said: “I think we’ve got to that stage of the season where it doesn’t matter how the performances are, it’s the result that’s important and that three points edges us a bit closer. “It was a bit of a scrappy game. When we did have the chances in the second half I think we could’ve done a bit better, but we showed what we’re capable of doing with the goals. “Of course it was going to be tight; you would always expect a tight affair. We’ve got aspirations of where we want to be and we’ve got stuff to lose as such. “I thought we defended relatively well. First half they didn’t have any real clearcut opportunities. Second half we were saved by the post and Matt (Cruttwell, Common’s goalkeeper) made a tremendous save.